Three of the best fruits for you to grow at home. 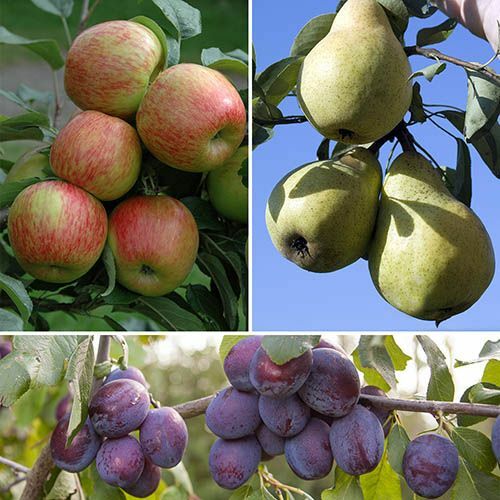 Grow three of the UK’s favourite fruit varieties in your own garden! Grown on dwarfing root stocks, these fruit trees will always be compact and are perfect for patio pots. Easy to grow and ‘self-fertile’ (so no pollinator required). Apple Braeburn: The crisp and juicy white flesh of Apple Braeburn is considered by many to be the perfect sweet/tangy flavour balance, literally providing a flavour explosion with every mouthful! Grow three of the UK’s favourite fruit trees in your own garden and pick an abundant crop of delicious apples, pears and plums from your own orchard. These top-quality, traditional fruit trees produce full-sized crops in your garden or even in pots on your patio, so now anyone can grow their own fruit trees, even when space is limited. Grown on dwarfing root stocks, these fruit trees are perfect for smaller gardens or large patio pots. Easy to grow and self-fertile, so you don't have to worry about having a second tree to get a crop. Supplied as 90cm bare-root trees. Apple 'Braeburn' is the UK's most popular eating apple variety by far and is easy to grow - flourishing superbly when grown in your garden or in a large pot on your patio. Having what is considered by many to be the perfect sweet/tangy flavour balance, Braeburn apples are just slightly tart with subtle hints of pear and cinnamon They're one of the best apples for cooking too, in that they hold their shape and do not release a great deal of liquid making them ideal for tarts. Ideal for novice gardeners, Braeburn is a self-fertile apple tree that does not need another variety to act as a pollinator, so will easily produce good crops of bi-colored apples every year. Covered with a red to orange blush and highlighted with red stripes these apples are good to look at as well as being tasty. Apples will be ready to pick fresh from your tree by mid-October each season and will store well until the end of January if kept chilled but frost free. Growing to around 2m (6-7 ft) in 10 years ‘Braeburn’ is a great all-round apple and worthy of space in any garden. Plum ‘Stanley’ is fully hardy, remains compact and is perfect for patio pots and gardens of any size. Easy to grow and self-fertile, so no pollinator is required, plum Stanley crops reliably every summer, with the minimum of fuss. Yields even more heavily when pollinated with another, nearby variety of plum, gage or damson. Flowering fairly late, the showy white blossoms are rarely affected by frost, performing well even after a cold, wet spring – ideal for the UK climate, and marvelous for attracting pollinating insects. Stanley has deep violet fruits cover orange-yellow flesh that is satisfyingly firm, very sweet and juicy - delicious eaten straight from the tree, and great cooked for desserts and pastries. As an added bonus, it’s a freestone plum, meaning that the stone separates easily from the flesh. A good early-season pear variety, ‘Williams’ produces a regular crop of large, yellow, aromatic fruits with a typical 'pear flavour'. This British-bred pear is perfect for poaching and preserving, as well as eating fresh from the tree from mid to late September. Perfect for attracting pollinators into the garden, 'Williams' is self-fertile, plus as it flowers in the middle of the blossom season it can be pollinated by most other pear trees - meaning an even bigger crop. Growing to around 4m after 5 years, ‘Williams’ is a good all-rounder and worthy of space in any garden. Plant in full sun, in a sheltered position for outstanding results. Add Rootgrow Mycorrhizal Fungi when planting to give your plants a head start and establish faster. Low maintenance - water thoroughly if potted or when the ground is dry and prune lightly to retain an open shape.Apply a general purpose fertiliser in early spring, and mulch well. In June, many fruit trees naturally shed some fruit ('June-drop'). If your tree still looks like it will produce a lot of fruit, you can thin each group to two healthy fruits, one on either side of the cluster.